CD24, a heavily glycosylated protein marker of intestinal crypt stem cells and Paneth cells, is upregulated in inflammatory bowel disease (IBD).3 ,4 Sato et al3 demonstrated that the combination of CD24hi and increased side scatter on flow cytometry can be used to sort Paneth cells from mouse intestinal stem cell cultures (‘organoids’). Small intestinal stem cell crypts were isolated from C57BL/6 NOD2WT and NOD2KO mice housed separately in specific pathogen-free conditions.3 Intestinal crypts of NOD2WT and NOD2KO mice (expressing green fluorescent protein controlled by the NOD2 promoter) were maintained in Matrigel (Becton, Dickison & Company) and organoid medium (Advanced DMEM/F12, Glutamax 100×, Hepes 1 M 100×, Pen/Strep 100×, B27 Supplement 50×, N2 Supplement 100× (all from Invitrogen) and N-acetylcysteine 500 mM 400× (Sigma-Aldrich)) containing R-Spondin-conditioned medium (prepared from HEK293T cells expressing R-Spondin, provided by Calvin Kuo, Stanford), murine recombinant Noggin (Peprotech) and murine recombinant epidermal growth factor (Invitrogen) as described by Clevers et al.3 Medium was changed three times weekly and organoids were passaged once weekly. For flow cytometry, organoids were isolated from Matrigel using cold organoid medium (P1000 pipette) followed by trypsinisation to disrupt the intestinal crypts before resuspension in fluorescence-activated cell sorting buffer. There was no difference in Paneth cell numbers (CD24hi, side scatter +) between NOD2WT and NOD2KO intestinal organoids (3.83% vs 3.90%, figure 1). Flow cytometry of intestinal stem cell cultures (representative of two experiments) demonstrates the expected high level of expression of the epithelial cell marker epithelial cell adhesion molecule and comparable CD24hi/side scatter+ cell populations (3.83% vs 3.9%), independent of NOD2. Next, we performed a genetic association analysis of the rs3838646 polymorphism in 1038 adult IBD patients, 351 childhood-onset IBD (<17 years at diagnosis) and 940 healthy controls (as described previously).8 Due to the presence of a CD24 pseudogene on the Y chromosome, only female IBD patients (n=737) versus female controls (n=498) were analysed to avoid non-specific amplification of the TaqMan assay. Our study had 80% power to detect association with OR 1.46 and OR 1.62 (with IBD and CD, respectively, using Quanto software (http://hydra.usc.edu/gxe)). Genotype frequencies and allelic frequencies did not differ between IBD/CD patients and controls (table 1). 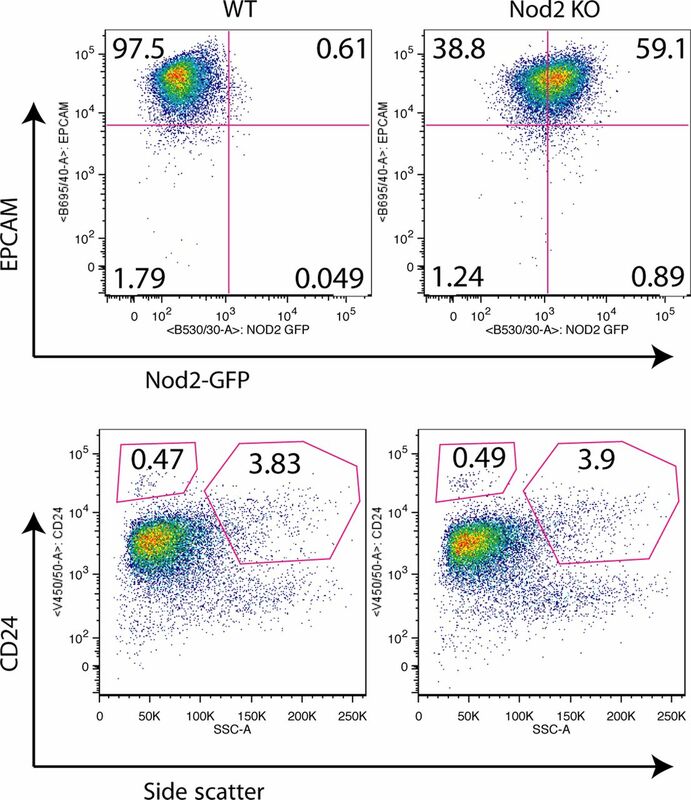 In conclusion, using intestinal stem cell cultures from NOD2WT and NOD2KO mice, we have demonstrated by means of CD24-based flow cytometry that NOD2 status does not influence Paneth cell numbers. In the high-incidence Scottish IBD population, the CD24 gene polymorphism (rs3838646) is not an important determinant of genetic susceptibility to IBD/CD.
. Mouse Paneth cell antimicrobial function is independent of Nod2. Gut 2014;63:903–10.
. Nod1 and Nod2 signaling does not alter the composition of intestinal bacterial communities at homeostasis. Gut Microbes 2013;4:22231.
. Paneth cells constitute the niche for Lgr5 stem cells in intestinal crypts. Nature 2010;469:415–18.
. CD24 is upregulated in inflammatory bowel disease and stimulates cell motility and colony formation. Inflamm Bowel Dis 2010;16:795–803.
. Analysis of the influence of two CD24 genetic variants in Crohn's disease and ulcerative colitis. Hum Immunol 2011;72:969–72.
. CD24 polymorphisms affect risk and progression of chronic hepatitis B virus infection. Hepatology 2009;50:735–42.
. Detailed assessment of NOD2/CARD15 exonic variation in inflammatory bowel disease in Scotland: implications for disease pathogenesis. Genes Immun 2008;9:556–60.
. Definition of phenotypic characteristics of childhood-onset inflammatory bowel disease. Gastroenterology 2008;135:1114–22. Acknowledgements The authors would like to thank Dr S Middendorp, Prof E Nieuwenhuis and Prof H Clevers (Utrecht, the Netherlands) for their help and advice in setting up the intestinal organoid cultures. Contributors JVL: study design, performed experiments, wrote manuscript. KG: study design, performed experiments, manuscript preparation. PH: genotyping, data analysis, manuscript preparation. RKR: patient and data collection, manuscript preparation. HED: patient and data collection, genotyping quality control, data analysis. JS: patient and data collection, study design, manuscript review. AMG: supervisor of experiments, study design, manuscript preparation. DJP: study design, supervisor of experiments, manuscript preparation. DCW: study design, genotyping, patient and data collection, manuscript preparation. Funding JVL was supported by a Canadian Institutes for Health Research (CIHR)/Canadian Association of Gastroenterology Fellowship (234622), the University of Toronto Edward Christie Stevens Fellowship, Nellie L Farthing Fellowship, the William S Fenwick Fellowship, the Chisholm Memorial Fellowship, the Miriam Neveren Memorial Award and the Joseph M West Family Memorial Fund, and was the holder of the 2011 CIHR Bisby Fellowship. DP is a Howard Hughes International Scholar and is supported by the CIHR and Canadian Crohn's and Colitis Foundation (CCFC). PH was supported by a Medical Research Council project grant for PICTS to DW (G0800675), by Schering-Plough and the GI/Nutrition Research Fund, Child Life and Health, University of Edinburgh. RKR is supported by a NHS Research Scotland career fellowship award. Data sharing statement CD24 genotyping: only female patients and controls were analysed due to pseudogene on the Y chromosome.